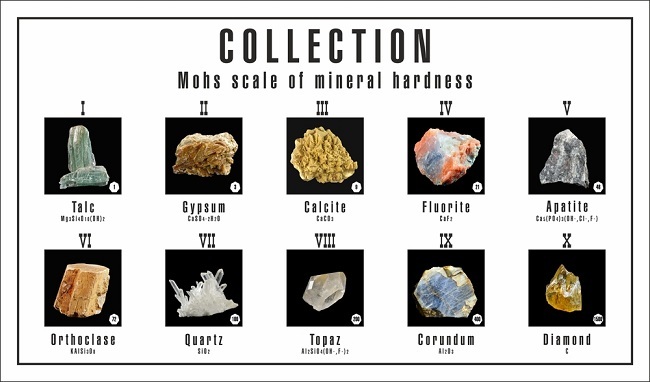 The Mohs hardness scale is a tool used in mineralogy to determine a mineral’s resistance to being scratched and aid in the identification of minerals in the field. The principle behind the Mohs hardness scale is that between two minerals, the harder one can be used to produce a scratch mark on the surface of the softer one, while the softer mineral will not be able to produce a scratch mark on the harder one. Because the standard of hardness for each integer along the scale is a type of common mineral, called an index mineral, the Mohs hardness scale does not have any units. Instead, the mineral is given a number that represents its hardness relative to other minerals. For example, a mineral such as halite, which is a 2.5 on the Mohs hardness scale, is harder than gypsum (2 on Mohs hardness scale) and will not be scratched by it, but softer than calcite (3 on Mohs hardness scale), which will scratch it. Almost all solid substances on Earth are between 1 (talc) and 10 (diamond) on the Mohs hardness scale. The Mohs hardness scale was created by and named for German geologist Friedrich Mohs. Mohs was particularly interested in studying the physical properties of minerals instead of their chemical composition, as was customary in the study of mineralogy at the time. 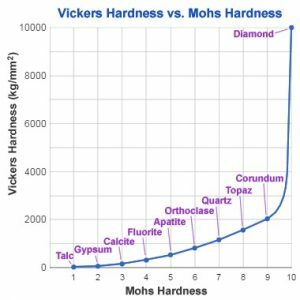 The Mohs hardness scale was developed in 1812 and is, to this day, the most commonly used hardness test in the natural sciences, although more quantitative hardness scales exist. One such test is the Vickers scale, which measures a material’s resistance to a force applied by a known mass. When Mohs developed his method for using resistance to being scratched to assist in mineral identification, he simply chose 10 common minerals, ordered them from softest to hardest, and somewhat arbitrarily assigned the integers 1 through 10 to describe each mineral’s hardness. 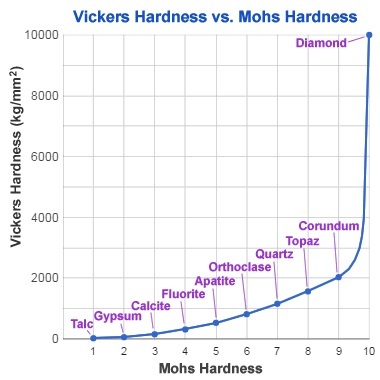 Therefore, when we look at the relationship between Mohs’ qualitative scale and Vickers’ quantitative scale, we can observe that the difference in hardness between each index mineral on the Mohs scale is not constant. We also observe that the difference in between the softer index minerals is smaller than the difference between harder index minerals. This kind of scale is called an ordinal scale, meaning the categories of each integer are observable in nature but the distance between them is variable. Talc (1): about the consistency of chalk and is very easily turned into a powder. Gypsum (2): can be scratched with a fingernail, but not a penny. Calcite (3): can be scratched with a copper penny. Fluorite (4): can be scratched with a nail, but with difficulty. Apatite (5): about the same hardness as teeth and can be scratched with glass or a steel knife blade. Orthoclase feldspar (6): one of the most common minerals on Earth, and can be scratched by a steel file or blade with some difficulty. Quartz (7): the second most abundant type of mineral in the Earth’s crust. Topaz (8): used commonly for gemstones in jewelry because of its hardness. Corundum (9): creates the gem varieties ruby and sapphire and is commonly used as an abrasive on sandpaper for commercial machinery and building tools. Diamond (10): one of the hardest materials on Earth. It is often used to build blades on heavy-duty cutting tools because of this property. To perform a Mohs hardness test on a mineral specimen, a Mohs hardness testing kit is required. Often, this is a tray containing the 9 index minerals, labeled 1-9 and laid out in order of hardness (diamonds are often left out of field kits due to their high cost). Find a flat, unscratched surface on the specimen in question on which to perform the test. Pick an index mineral from your kit to start. To decide where to start, use other physical properties of the specimen to make a guess at what the mineral is, and start with an index mineral that is close to your best guess. Find on the surface of your chosen index mineral a point that you will use to try to scratch your specimen. Use the point to scratch the flat surface of the specimen, pressing firmly and evenly while dragging the index mineral across the surface in a distinct line. Examine the scratched surface, being sure to wipe away any powder that may have been produced by the scratch. Note the difference between a scratch, which leaves an actual indent on the surface and a streak, which leaves a colored powder but no deformation. If the surface is scratched, select the next softest index mineral and perform the test again, until the index mineral is no longer producing a scratch and the specimen’s hardness is determined. The hardness of the specimen is a number in between the index mineral that left a scratch and the index mineral that did not. If the surface is not scratched, choose the next hardest index mineral and perform the test again, until the surface of the specimen is scratched and the hardness is determined. Even faster than performing a Mohs hardness test is a common objects test, which uses the same principle and methods of the Mohs hardness test but uses objects that may be more readily available, such as a fingernail (2.5), penny (3), nail (4), or glass (5). 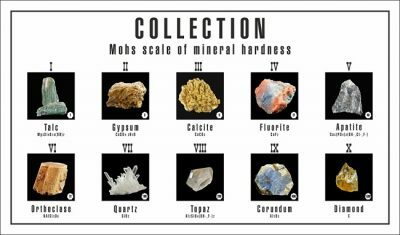 The reason for the Mohs hardness scale’s popularity is likely its convenience in assisting in quick mineral identification for field geologists. It is particularly useful in differentiating between minerals that may have similar physical properties and depositional settings. For example, a mineral in the field may have many properties that calcite and quartz share. However, we know that quartz is a much harder mineral than calcite (quartz is a 7 and calcite is a 3 on the Mohs hardness scale). By performing a simple scratch test to determine how hard the mineral in question is, we can quickly determine whether we are looking at quartz or calcite. It is important, however, to note that there are variations in hardness among specimens of the same mineral type. When looking up the hardness of various minerals, it is common to see them listed as a range over half or even a whole integer. This variation can occur in minerals of the same type that are grown in different conditions, resulting in different habits and other physical properties. Another way this can occur is if the specimen in question has undergone significant weathering, making its surfaces softer and easier to scratch. Avoid an inaccurate test by choosing a fresh surface to test on. 1. Which of these hardness scales is considered quantitative? 2. Which of the following minerals is not an index mineral on the Mohs hardness scale? 3. Which of these options lists the index minerals in order of softest to hardest?